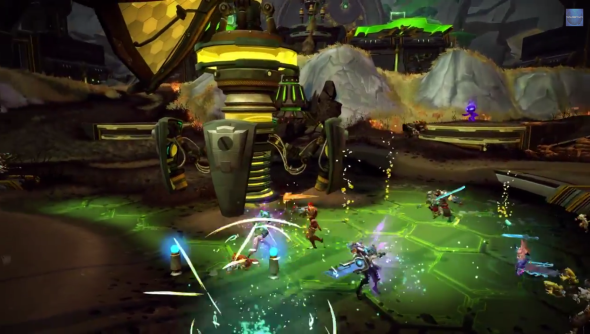 Daggerstone Pass is a 15 v 15 battleground that will be added to Carbine’s MMO, Wildstar, in the Sabotage update. The battleground is unique in that it lets you use mounts to get across the map quickly. To win you need to destroy the fusion core in your opponents’ base. You don’t just waltz up and shoot the thing, instead there are uplink points around the map that you can use to call in airstrikes on the enemy core. There is another way to destroy the enemy core. It’s a tad more dangerous, though. Walking up to the thing with a giant bomb. The bombs can be dropped anywhere, so, in theory you could drop it next to other players, their mounts, their dolls house, their grandma, their china tea set, or whatever they treasure most. You can find more details over on the Wildstar page.